The Proserpine rock wallaby averages about 5 - 7 kg (11 - 15 lb) in weight. It usually is found in rocky outcrops in rainforests, surrounded by open woodland with a grass understory. The rock outcrops provide shelter and home sites and the grassy understory of the surrounding forest provides food (Grass is the preferred food of rock wallabies.). The Proserpine rock wallaby is a shy animal which quickly moves away over the rocks when it feels threatened. Rock wallabies are terrestrial, although they can climb trees with sloping trunks. The Proserpine rock wallaby was first documented by science in 1976. It occurs in a small number of rainforest habitats in a limited area in northeast Queensland, Australia, near Proserpine and on several islands in the Whitsunday group. This region is heavily developed. Some of the places where it is found include Conway, Dryander and Gloucester Island National Parks and the Clarke Range. The Proserpine rock wallaby is extremely vulnerable to habitat loss or disturbance. It is presently endangered by the rapid rate of development from the tourism and agricultural industries and from urban development. In addition to habitat loss, development has caused many colonies to be cut off from one another permanently. It is also thought to have declined partly as a result of competition with the more widely distributed unadorned rock wallaby, Petrogale inornata. 2004: Occurs in Australia (Queensland) (IUCN 2004). The Proserpine rock wallaby was first documented by science in 1976. It occurs in a small number of rainforest habitats in a limited area in northeast Queensland, near Proserpine and on several islands in the Whitsunday group. This region is heavily developed. Some of the places where it is found include Conway, Dryander and Gloucester Island National Parks and the Clarke Range. Since the Proserpine rock wallaby has the smallest known distribution of any rock wallaby, it is extremely vulnerable to habitat loss or disturbance. It is presently endangered by the rapid rate of development from the tourism and agricultural industries and from urban development (e.g., there has been an increase in road kills). In addition to habitat loss, development has caused many colonies to be cut off from one another permanently. It is also thought to have declined partly as a result of competition with the more widely distributed unadorned rock wallaby, Petrogale inornata. The female Proserpine rock wallaby weighs 4 - 7 (average 5.2) kg (9 - 15 (average 11) lb); males weigh 5 - 10 (average 7.2) kg (11 - 22 (average 16) lb). 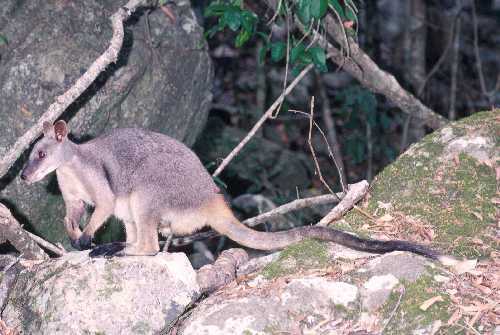 The Proserpine rock wallaby usually is found in rocky outcrops in closed canopy deciduous forests, surrounded by open woodland with a grass understory. The rock outcrops provide shelter and home sites and the grassy understory of the surrounding forest provides food. The few available observations indicate that the Proserpine rock wallaby has a prolonged (perhaps continuous) breeding season. The Proserpine rock wallaby can keep embryos in embryonic diapause until they are needed. Grass is the preferred food of rock wallabies. The Proserpine rock wallaby is a shy animal which quickly moves away over the rocks when it feels threatened. Rock wallabies are terrestrial, although they can climb trees with sloping trunks.